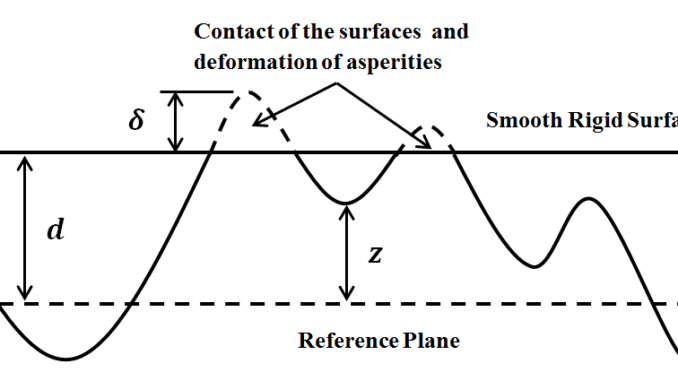 Surface roughness was recognized to play a major role in forming friction and transition from one lubrication regime to another . Greenwood pioneered with first rough contact model in 1966 . Inspired by this milestone work a branch of dry contact models was born. With time, a substantial number of models is constructed to overcome certain assumptions employed in the initially developed theory, however, due to its analytical nature Greenwood’s model is still being used in estimation of friction coefficient and wear [3,4]. where . and are the elastic moduli and Poisson’s ratio of bodies 1 and 2 correspondingly. Zhu D. On the Lambda Ratio Range of Mixed Lubrication. Proceedings of the Institution of Mechanical Engineers, Part J: Journal of Engineering Tribology. 2012;226:1010-22. Greenwood J, A., Williamson, G.,P.,B. Contact of Nominally Flat Surfaces. 1966;295. Andersson S, Olofsson U. Simulation of Plastic Deformation and Wear of a Rough Surface Rubbing Against a Smooth Wear Resistant Surface. Rotrib, 10-th International Conference on Tribology. Bukharest2007. Faraon IC, Schipper DJ. Stribeck Curve for Starved Line Contacts. Journal of Tribology. 2007;129:181-7. Johnson KL. Contact Mechanics. Cambridge: Cambridge University Press; 1985. Faraon IC. Mixed lubricated line conacts. PhD thesis. : University of Twente; 2005.